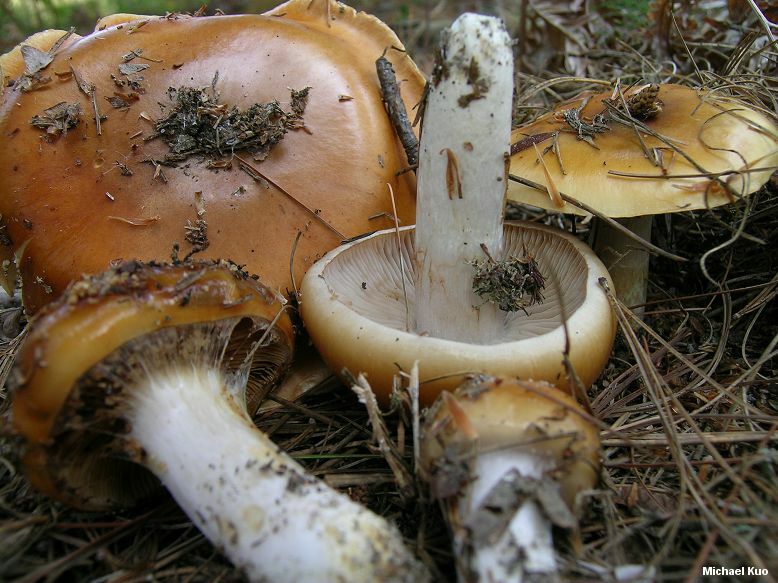 Despite its disgusting name, Cortinarius mucosus is an attractive (if slimy) species, characterized by its brownish orange cap, its Russula-like stature, its straight and slimy stem, and its preference for pines. 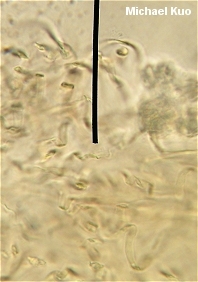 Under the microscope it features a gelatinized pileipellis and large, flask-shaped spores. Ecology: Mycorrhizal with pines (especially, but not exclusively, with 2- and 3-needled pines) and with other conifers; growing alone, scattered, or gregariously; late summer and fall; apparently widely distributed in North America. Cap: 4-12 cm; convex, becoming broadly convex or nearly flat; slimy when fresh; bald; brownish orange, fading to orangish or yellowish with age. 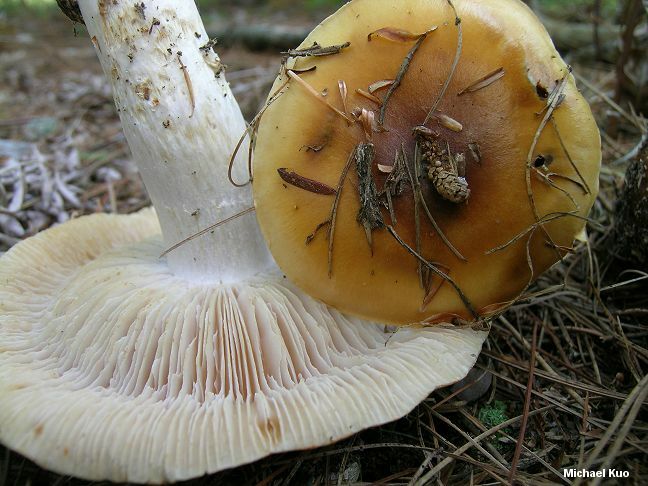 Gills: Attached to the stem; close or nearly crowded; creamy at first, becoming cinnamon to rusty brown. Stem: 4-10 cm long; up to about 2.5 cm thick; more or less equal; white; covered with a glutinous slime veil when fresh and young, but eventually more or less dry; often with rusty fibrils or a ring zone. Chemical Reactions: KOH blackish red on cap surface. 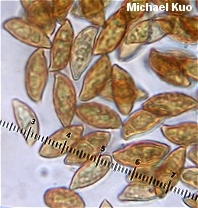 Microscopic Features: Spores 11-17 x 5-7.5 µ; amygdaliform; moderately to strongly verrucose. Pleuro- and cheilocystidia absent; marginal cells occasional. Pileipellis an ixocutis of clamped, ochraceous elements. REFERENCES: (Bulliard, 1792) J. J. Kickx, 1867. (Saccardo, 1887; Kauffman, 1932; Smith, Smith & Weber, 1979; Moser, 1983; Weber & Smith, 1985; Arora, 1986; Hansen & Knudsen, 1992; Breitenbach & Kränzlin, 2000; McNeil, 2006.) Herb. Kuo 09110502.